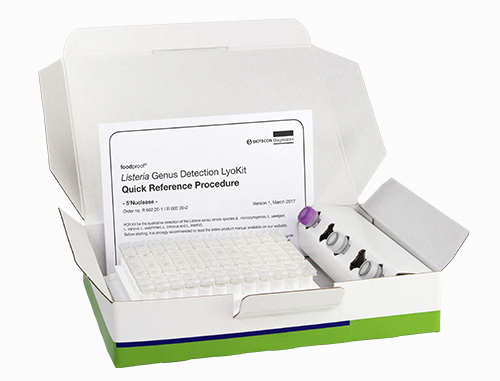 In addition to the foodproof Listeria monocytogenes Detection LyoKit, BIOTECON Diagnostics offers the foodproof Listeria Genus Detection LyoKit for the detection of the sensu stricto Listeria species. The sensu stricto definition includes six species: L. monocytogenes, L. innocua, L. seeligeri, L. welshimeri, L. ivanovii and L. marthii. Though predominantly L. monocytogenes causes food-related illness, the Listeria sensu stricto species are ubiquitous and often used as a hygiene indicator. Frequently contaminated foods are uncooked products, such as salmon, raw milk, raw sausage or raw cured meat.